There are two Flowers slot games available at NetEnt software powered casino sites the first is the original slot and the second is this Christmas Edition slot. You may be wondering just what differences there is between those two slots and to be honest not much! In fact, the only thing that you will notice in regards to the two version of the Flowers slot game is that the Christmas Edition slot comes with some Christmas type graphics on the slot game screen and on some of the reel symbols! However, if you ever do fancy getting into the Festive Spirit at any time of the year then you may enjoy playing this slot! It is a slot game on which there are 30 fixed pay lines and as such you do have to activate every single payline when playing it, so keep that in mind. One noticeable thing that you will discover about the reel symbols is that some of them are Split Symbols, and as such those symbols count as two symbols, so you could spin in a winning combination that contains up to ten matching symbols as opposed to just five of them. 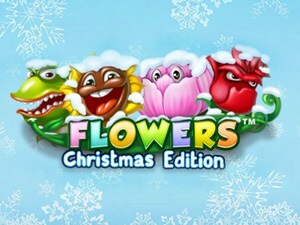 Wild symbols are attached to the reels of the Flowers Christmas Edition slot much like they are on the original version of this slot and those symbols will stand in for all standard reel symbols, but not the bonus game awarding scatter symbols and they do not stand in for the Double Reel symbols either. During the free spin bonus game however the Wild symbols grow in size and as such become Stacked Wild symbols for the duration of that bonus game, and that does mean that you could get three of them in view on any or all of the reels during the bonus feature game. One thing worth noting is that the scatter symbols are stacked just like the standard reel symbols, and it will take at least four of them not the standard three of them to spin in to see you then being awarded with a set of free spins. The free spins can also be re-triggered as the initial set are playing off, refer to the pay table of this slot to discover just how many free spins you will get to play off based on just how many scatter or double scatter symbols you have spun in, as the more of them that do spin in the more free spins are then credited to you. To be perfectly honest we cannot really see the point of the Flowers Christmas Edition slot, for it is almost identical to the original Flower slot, apart from the fact there are a few little snow and Christmas related graphics on the screen! However, being a festive themed slot then there may just be some benefits of playing this slot around Christmas time each year as opposed to playing the original slot. For many casino sites offer a range of promotional offers on any slot games that does boast a festive theme in or around Christmas time each year, so always be on the lookout for them as they may allow you to lock in a bit more value and play time if you ever do get the urge to play this slot in December!